This might just be the sweetest Valentine’s Day story I’ve ever heard. It’s definitely the sweetest Valentine’s Day story I’ve ever written. Kaitlyn Trigger is a marketing director at Rally.org. She also happens to be Instagram co-founder Mike Krieger’s girlfriend of two and a half years (The 26 year old Krieger and 27 year old Trigger met at a friend’s house in October of 2009 and moved in together in October 2010). And my hero. Last December, Trigger decided she wanted to be able to talk to her boyfriend in depth about the stuff he was working on. So the Yale political science major who “never took any computer classes” covertly downloaded “Learn Python the Hard Way” and began the Odyssey into programming, deadline Valentines’ Day. After she learned Python, Trigger then had to complete a Django tutorial in order to bring the Python online — she used Heroku to push stuff to a webserver. She spent marathon weekends building the site, leaving the apartment for a total of three hours on the Martin Luther King holiday in order to finish by February 14th. “Learning to program isn’t the hard part. The biggest challenge is figuring out how all the moving parts of a web application fit together. There’s no book for that,” she said. To use Lovestagram simply sign in with your Instagram account, enter the name of your beloved and choose from one of three adorable designs, Lovestagram Rainbow, Mr. Pink Camera and Cinnamon Heart Candy (I’ve been constantly ‘Awwing’ the entire time I’ve been writing this, by the way.). 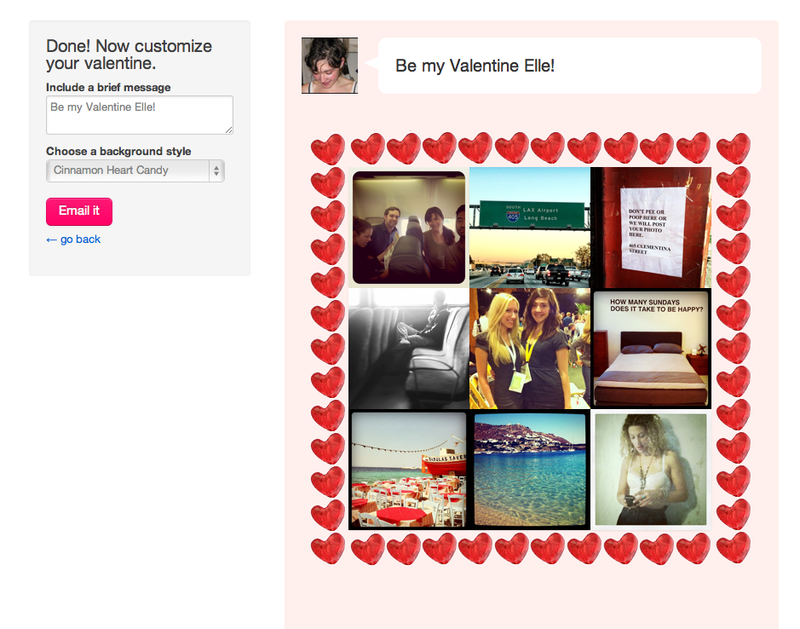 You can then customize the message and send off to your beau. Here’s a Lovestagram that Kaitlyn sent to Mike and yes, she actually wrote, “Like an Instagram filter, you make my world more beautiful.” And yes she also had to learn Photoshop to come up with the the three different designs, “It’s almost harder than Python,” she told me. While the service ended up looking amazing, her plan to keep it a secret from Krieger didn’t work, mainly because of her frustration with working out bugs, “Something would take me an hour and a half and I knew that ten feet away is someone who could fix the same bug in ten seconds.” So she spilled the beans. As someone who might have dated a programmer at some point, I feel Trigger’s pain when she described the state of Krieger sitting in front of computer as “not knowing what he was doing.” “It’s hard in a city where most of the men are software engineers and most of the women are not,” she says (for the record I also tried and failed to learn Python – more on that later). It’s also something that you don’t need a significant other for necessarily. The best V-Day gift of coding skills you can give, is the V-Day gift of coding skills you give to yourself.